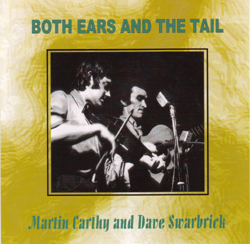 Martin Carthy/Dave Swarbrick"Both Ears and the Tail"
This fascinating recording from the Folkus Folk Club in Nottingham features these two fixtures of the English folk scene in a lively and rambunctious performance and includes several songs not on any of their other releases. Recently-written liner notes from Carthy puts the performance in context and describes the details of the show (and explains the title of the CD!). This release coincides with Martin Carthy's four-week tour of solo and Waterson/Carthy performances. 2/24/01 ANCHORAGE, AK WILDA MARSTON THEAT. 3/3/01 CUMBERLAND, RI BLACKSTONE RIVER THEAT. Booklet contains complete lyrics and liner notes.